Karen Greve Young is the Chief Executive Officer of Futurpreneur Canada, Canada’s only national organization dedicated to supporting young entrepreneurs. Futurpreneur’s unique model combines funding, mentorship and start-up programs to fuel the success of thousands of young entrepreneurs in every Canadian province and territory. Karen is an accomplished non-profit leader dedicated to fostering economic and social prosperity through new approaches and partnerships. Prior to joining Futurpreneur in 2018, Karen was the Vice President, Corporate Development & Partnerships at MaRS Discovery District, a global innovation hub based in Toronto. During her seven year tenure, Karen led corporate strategy development, implementation and measurement, managed a global network of innovation partners, and oversaw community engagement including marketing, communications and events. 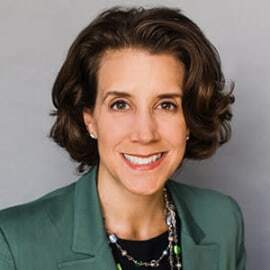 She has previously held finance, management and strategy roles in San Francisco, New York and London, UK, at organizations including Bain & Company, Gap Inc. and the UK’s Institute of Cancer Research. Along the way, she co-authored a book with her mother about their shared experience through her mother’s ovarian cancer journey. Karen holds an MBA from Stanford University’s Graduate School of Business and a BA in Economics from Harvard University.